Making Strange: Chicken Tikka ... What?! East Indian food is very popular here in the UK. On nearly every corner there is an Indian restaurant of some variety -- some good and some quite grim looking. Most people here are very well-versed in their East Indian food language. Even Chris' nephews (seven and three) probably know the difference between a vindaloo and a madras sauce and can give you the definition of a bhuna. I happen to really like Indian cuisine and frequented all three or four of the restaurants in Regina. My favorite was India House, preferably for lunch when they had their wonderful buffet of endless steaming curries and pakoras. But as a Canadian, my love pales in comparison to the love the British feel for it and most fervently for one dish in particular ... chicken tikka masala. It doesn't seem to matter where you go from an Indian restaurant, pub or Italian place, there is almost always some version of this dish (usually served with chips or rice) on the menu. Sometimes they forget the chicken and just give you the sauce on the side of fries for dipping. 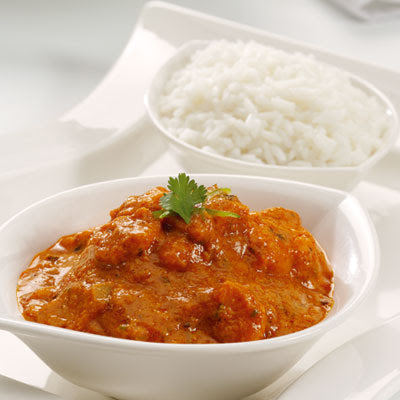 A widely reported explanation of the origins of the dish is that it was conceived in Glasgow in the late 1960s, when a customer, who found the traditional chicken tikka too dry, asked for some gravy. The chef supposedly improvised a sauce from tomato soup, yogurt and spices. At least one source has the dish originating in Delhi in 1947. Another theory is that it originated in British India to adapt local dishes to the British palate. A prototype may be Murgh Makhni (butter chicken), a dish from the Punjab region of India. Despite these other claims, the UK citizenry seem quite sure that the chicken tikka is theirs. One foreign affairs minister went so far as to name it the national dish of Britain. If point one is how the British believe they created the dish I find it hard to believe. I can't even order an egg here to spec, never mind ask a server to ask a cook to throw around some extra spice and yoghurt. Perhaps odder than their sense of pride over the recipe is the creative ways they try to incorporate it into non-Indian cuisine. 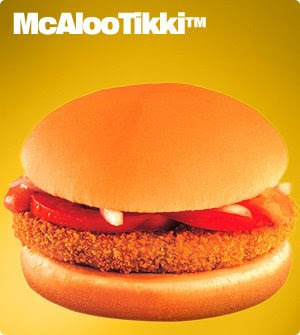 Apparently a few years ago MacDonalds introduced a Chicken Tikka Burger called the McAloo, which must not have been terribly popular as it isn't on the menu here anymore (shocking, I know!). More recently a frozen food chain called Iceland is advertising a "yummy" chicken tikka lasagne on their television commercials. Apparently that was the year McD's tried to make a burger for nearly every country it could fathom. I don't think any of them were particularly popular, which only confirms that they should really stick to doing what they do best: straight up beef burgers. I was surprised to see curry sauce sold at chip shops myself - I've never run into a curry house that sold chips though (except those that serve a token English dish for anyone who doesn't like curry). I haven't been too adventurous with the curry myself, because it's just as easy to have a bad one, but so far I've had nothing to rival India House in both price and flavour. Sigh. 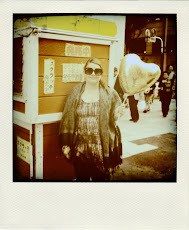 Oh, and Iceland is definitely the bottom of the barrel for good eats by anyone's standards - avoid it at all cost!